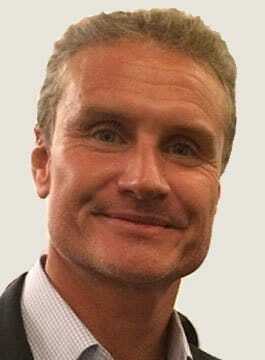 David Coulthard MBE is a former Formula One Racing Driver. He made his Formula One debut in 1994. He was then a test driver with Williams, but following Ayrton Senna’s death at Imola, he was promoted to the race team alongside Damon Hill for the Spanish Grand Prix. He won 13 Grand Prix in a career spanning 15 seasons. Twice a winner in the Monaco GP, David Coulthard was team-mate to Mika Häkkinen in the Finn’s two Drivers’ Championship winning seasons for McLaren Mercedes before helping establish the Red Bull team. Coulthard amassed a notable points haul placing him seventh on the all-time scorers list. His best Drivers’ Championship finish was second in 2001. David is now a BBC TV Formula One commentator while also being a team consultant for Red Bull Racing and Scuderia Toro Rosso. He returned to racing as an active driver in the DTM series for 2010, piloting a 2008 Mercedes-Benz C-Class for Mücke Motorsport. David’s presentations are jointly presented with one of the World’s leading F1 related keynote speakers – Mark Gallagher. Mark sets the sets the scene with an introduction of about 15 minutes. He then welcomes David on stage and conducts a Question and Answer session of 30 – 40 minutes. Questions can be agreed in advance to ensure the topics covered in the session match the theme of the event and the specific objectives of the client. Teamwork – How a top Formula One team enables drivers, technicians, engineers and sponsors to work together to create a winning team. Leadership – Examples of great leadership that David has observed in his Formula One career and lessons he has learned.